British MP Renfield R. Renfield was the sole politician in the world to have been among the 600 officially invited guests to the wedding ceremony of Prince Harry and Meghan Markle on this Saturday May 19th 2018 in Saint George’s Chapel at Windsor Castle. Renfield managed to get an invitation to the wedding by presenting Prince Harry and Meghan with an original painting of the wedding ceremony at Cana of Galilee (where the Lord Jesus Christ turned water into wine 🍷- one Biblical passage that is not often talked about in most teetotaling Baptist Church sermons) painted by the great early 19th Century Japanese artist Katsushika Hokusai. Renfield gave the painting to the couple on the very day they announced their engagement on November 27th of last year. The Queen approved of the invitation to Renfield as she was rather fond of him since he saved one of her Welsh corgis from drowning in a swimming pool. Renfield arrived dressed in a dashing looking formal suit, tie, top hat and late Victorian early Edwardian walking stick. He also wore a red rose 🌹 in his lapel (a red rose that had been given to him by his good friend the famous London art gallery dealer Dashwood Forrest). Dashwood was grateful to him because Renfield managed to convince Set Enterprises’ chief scientist Dr. Cadbury Rocher to postpone laser eye surgery treatment on some rather important celestial deities and instead perform surgery on and stitch together Forrest’s living dead Irish manservant Mulligan the Irish zombie 🧟‍♂️. Mulligan had been blown to pieces when he had rather heroically landed on top of a suicide bomber to prevent anyone else being injured or killed at the official opening of the U.S. Embassy in Jerusalem earlier this week. In addition to giving Renfield the rose to put in his lapel, Dashwood also showed him the latest painting he had acquired painted by the little known Renaissance English painter Henry Tudor (better known to history as Henry VIII). The painting was of Henry’s mistress later 2nd wife Anne Boleyn. Coincidentally enough, Anne Boleyn herself had been beheaded on this date May 19th back in 1536. Renfield thoroughly enjoyed the service at Saint George’s Chapel. He thought he might be able to catch some sleep during the sermon (as Renfield often slept through most sermons given by Church of England clergy) but to his surprise the sermon was given by the Presiding Bishop of the U.S. Episcopal Church Bishop Michael Bruce Curry who spoke with all the passion and fervour of a Southern Gospel preacher or Pentecostal minister. Renfield was absolutely riveted by Bishop Curry’s address on The Power of Love (as was everyone else in Saint George’s Chapel on this day). He made a mental note to himself to ask his friend Amadeus Emanon to lend him his Bible so he could read for himself The Song of Solomon to which Bishop Curry referred. After the service, Renfield went to the wedding reception to enjoy some wedding cake. He however was not among the 200 guests made up of close friends and family who were invited to the reception hosted by Charles Prince of Wales at Frogmore House on Saturday night. So Renfield chose to walk around Windsor Castle late at night. It was then that Renfield saw the woman who was the spitting image of Anne Boleyn in the Henry Tudor painting now in the possession of Dashwood Forrest. The ghost of Anne Boleyn- this time with her head once again upon her shoulders. The man walked around the exhibit at the Dashwood Forrest Art Gallery in London. The exhibit was titled Paris In The 1890s. As he stared at each portrait of a beautiful Parisienne woman sitting in a sidewalk cafe, the man felt he had been there. That he had once met each woman in the particular portrait. “You get the feeling that the artist himself was actually there, don’t you?” Forrest the art gallery proprietor remarked as he walked over to the man. The man turned and walked out into the night. And then quite literally vanished. 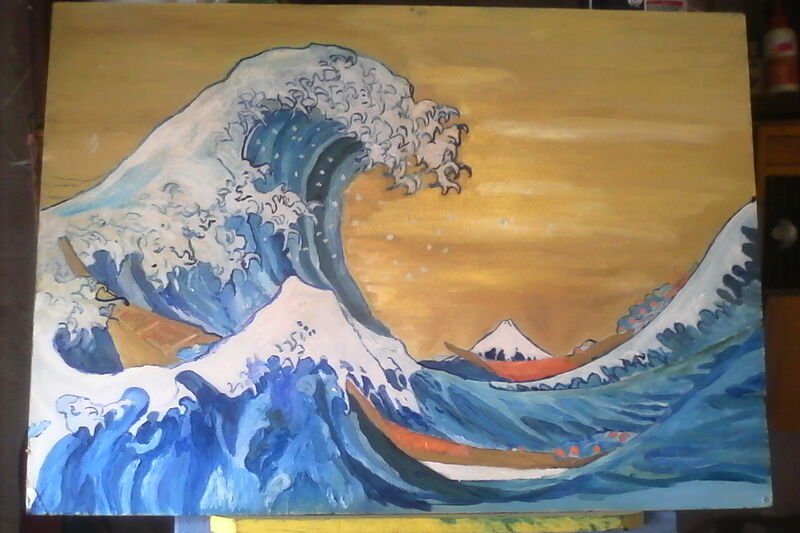 My friend the up and coming South African artist Timothy Wood who paints under the name SAREJESS has just finished painting his reproduction of the great Japanese artist Katsushika Hokusai’s masterpiece The Great Wave 🌊. 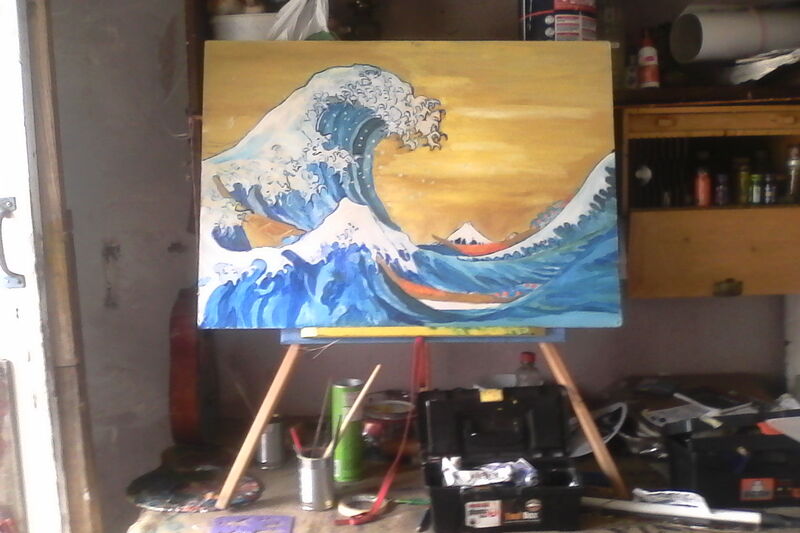 A few months ago I happen to see a program about the paintings of Japanese Artists at the time I thought “that is easy I can do That” I also thought of my friend in Canada Chris Milner who is on WordPress and of his love for things Asian. When the painting confounds them.